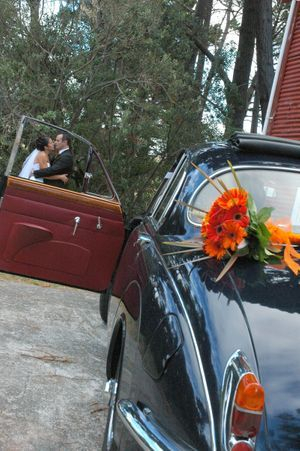 At Aristocrat Auto Hire, we can offer you four gorgeous navy blue Daimler's and Jaguars, dressed to your preferences. Each car can be dressed in your choice of an ivory, white, cream, or silver ribbon. You are able to view the dressed cars in our gallery. The cost of hiring a car from Aristocrat Auto Hire is $350 per car for three hours. Each of our cars can accommodate five people including the chauffeur. The chauffeur is included as part of the service. We offer very competitive quotes, and you will find that while we charge very low rates for our services, the quality of our cars and services remains impeccable. Viewings of the cars can be arranged, to arrange a time please contact us. Our all-inclusive quotes are extremely competitive, given the unique style and quality of our vehicles and the standard of service delivered. Customer feedback reports that we are amongst the best bridal car hire operators in Wellington, but this doesn't mean we're the most expensive! Our online inquiry has no obligation and no one will contact you once you've been emailed a quote; we leave it up to you to tell us if you'd like to proceed further. If you have any further questions, queries or comments, please contact us. Our unrivalled combination of immaculately presented vehicles, professional and friendly chauffeurs, reassuringly reliable service, and attention to the all important finer details, will help to make your wedding day one to remember.